Ginkgo leaves shown in their fall color, yellow. English : Ginkgo leaves shown in their fall color, yellow. English : Pieris rapae copulating. Yellow ipê or ipê-amarelo (Handroanthus chrysotrichus, syn. Tabebuia chrysotricha) in Avaré (Brazil). English : Yellow ipê or ipê-amarelo (Handroanthus chrysotrichus, syn. Tabebuia chrysotricha) in Avaré (Brazil). Geometric arabesque tiling on the underside of the dome of the Tomb of Hafez in Shiraz. English : Geometric arabesque tiling on the underside of the dome of the Tomb of Hafez in Shiraz. Seattle Skyline view from Queen Anne Hill. The Space Needle is visible on the left, the mountain in the background is Mount Rainier, on the right is the Port of Seattle on Puget Sound. English : Seattle Skyline view from Queen Anne Hill. The Space Needle is visible on the left, the mountain in the background is Mount Rainier, on the right is the Port of Seattle on Puget Sound. English : Amur tiger (Panthera tigris altaica) at the Buffalo Zoo. One of the cubs Thyme and Warner, with its mother Sungari. The cubs were born at the zoo to Sungari, and father Toma, on 7 October 2007. English : Animation of a simple constant-velocity joint. Copy of the 1602 map Kunyu Wanguo Quantu, created by Matteo Ricci at the request of the Wanli Emperor. English : Copy of the 1602 map Kunyu Wanguo Quantu, created by Matteo Ricci at the request of the Wanli Emperor. A cheetah in southern Namibia. It is urinating over a tree trunk. English : A cheetah in southern Namibia. It is urinating over a tree trunk. native Platinum nugget, locality Kondyor mine, Khabarovsk Krai, Russia. Size ca. 35 × 23 × 14 mm, weight ca. 112g = 3.6 oz. Collection: M.R. English : native Platinum nugget, locality Kondyor mine, Khabarovsk Krai, Russia. Size ca. 35 × 23 × 14 mm, weight ca. 112g = 3.6 oz. Collection: M.R. Fifth of Henry Holiday's original illustrations to "The Hunting of the Snark", a nonsense poem written by Lewis Carroll in 1874. English : Fifth of Henry Holiday's original illustrations to "The Hunting of the Snark", a nonsense poem written by Lewis Carroll in 1874. Cape Fur Seal (Arctocephalus pusillus) at Cape Cross, Namibia. English : Cape Fur Seal (Arctocephalus pusillus) at Cape Cross, Namibia. A vast alluvial fan blossoms across the desolate landscape between the Kunlun and Altun mountain ranges that form the southern border of the Taklimakan Desert in China’s XinJiang Province. The left side is the active part of the fan, and appears blue from water currently flowing in the many small streams. The image was acquired May 2, 2002, covers an area of 56.6 × 61.3 km, and is centered near 37.4 degrees north, 84.3 degrees east. English : A vast alluvial fan blossoms across the desolate landscape between the Kunlun and Altun mountain ranges that form the southern border of the Taklimakan Desert in China’s XinJiang Province. The left side is the active part of the fan, and appears blue from water currently flowing in the many small streams. The image was acquired May 2, 2002, covers an area of 56.6 × 61.3 km, and is centered near 37.4 degrees north, 84.3 degrees east. A gemsbok (Oryx gazella) at Etosha National Park, Namibia. English : A gemsbok (Oryx gazella) at Etosha National Park, Namibia. Two male Somali giraffes (Giraffa camelopardalis reticulata) are necking in San Francisco Zoo. English : Two male Somali giraffes (Giraffa camelopardalis reticulata) are necking in San Francisco Zoo. Image of the Orion nebula from the Spitzer Space Telescope. English : Image of the Orion nebula from the Spitzer Space Telescope. First successful flight of the Wright Flyer, by the Wright brothers. The machine traveled 120 ft (36.6 m) in 12 seconds at 10:35 a.m. at Kitty Hawk, North Carolina. 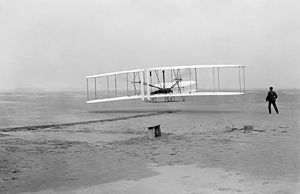 English : First successful flight of the Wright Flyer, by the Wright brothers. The machine traveled 120 ft (36.6 m) in 12 seconds at 10:35 a.m. at Kitty Hawk, North Carolina. Campanula (Thunb.) Lindl. : flowering shoot, photographed in a Swiss garden after a light shower. English : Campanula (Thunb.) Lindl. : flowering shoot, photographed in a Swiss garden after a light shower. Eastern American Toad (Bufo americanus americanus) in Jacques-Cartier National Park, Quebec, Canada. English : Eastern American Toad (Bufo americanus americanus) in Jacques-Cartier National Park, Quebec, Canada. English : Quartz from Tibet. Brazilian salmon pink tarantula (Lasiodora parahybana) adult female. English : Brazilian salmon pink tarantula (Lasiodora parahybana) adult female.